This series of modern classics about the charming Penderwick family from National Book Award winner and New York Times bestseller Jeanne Birdsall is perfect for fans of Noel Streatfeild and Edward Eager. Over one million copies sold, now with a bright new look! The Penderwick sisters are home on Gardam Street and ready for an adventure! But the adventure they get isn't quite what they had in mind. Mr. Penderwick's sister has decided it's time for him to start dating--and the girls know that can only mean one thing: disaster. Enter the Save-Daddy Plan--a plot so brilliant, so bold, so funny, that only the Penderwick girls could have come up with it. It's high jinks, big laughs, and loads of family warmth as the Penderwicks triumphantly return. "This is a book to cherish and to hold close like a warm, cuddly blanket that you draw around yourself to keep out the cold." "Just the sort of cozy fare that's missing in today's mean-girl world." "Birdsall writes with amazing grace." "[A]n old-fashioned (in a good way) read with well-drawn characters, warmth, and humor." "Birdsall's second novel . . . offers comforting comedy." "This is a book to cherish and to hold close like a warm, cuddly blanket that you draw around yourself to keep out the cold." Starred Review, Booklist, May 1, 2008: "Just the sort of cozy fare that's missing in today's mean-girl world." Starred Review, Publishers Weekly, April 28, 2008: "It's sheer pleasure to spend time with these exquisitely drawn characters, girls so real that readers will feel the wind through their hair as they power down the soccer field." Jeanne Birdsall lives in Northampton, Massachusetts, with her husband and a large assortment of animals. 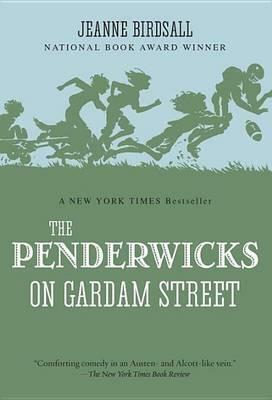 The Penderwicks on Gardam Street is her second novel.